When trying to lower regular monthly heating bills, there are a range of HVAC services and upgrades that can help. Maintenance, efficiency upgrades, indoor air quality devices… But even before all of that, the first place to look should be the thermostat. The thermostat is the control panel for every home’s heating and air conditioning system, allowing residents to set the temperature as they please and maintain it throughout the day. 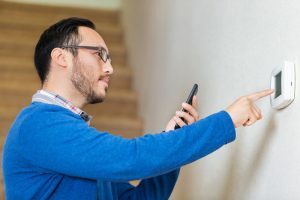 Modern thermostats offer features like smart programming and remote control via phone apps, but almost every thermostat these days comes equipped with basic programming features. Here in Rye, NY, and surrounding communities, those programming features become more important as the temperatures drop and winter grows closer. Judicious use of thermostats can result in considerable savings on monthly heating bills. A few tips for programming the thermostat are included below.